Bowling Green City Hall is located at 304 North Church Street, Bowling Green, OH 43402; phone: 419-354-6204. 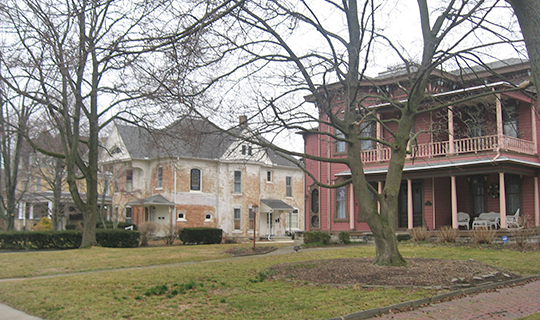 Photo: Homes along West Wooster Street, Boomtown Historic District, Bowling Green, OH. The Historic District was listed on the National Register of Historic Places in 1987. Photographed by User:Nyttend (own work), 2013, [cc0-by-1.0 (creativecommons.org/publicdomain/zero/1.0/deed.en], via Wikimedia Commons, accessed October, 2015. Originally known as Mt. Ararat, Bowling Green was first platted in 1835 and was named by Joseph Gordon, a regional mail carrier, after his favorite village—Bowling Green, Kentucky. Bowling Green was incorporated in 1855 and became the county seat of Wood County in 1867. Bowling green remained a small, healthy, agricultural community until late in the 19th century when the discovery of oil and natural gas in the county stimulated a sudden period of rapid growth. The Wood County area soon became a forest of oil derricks. Industries, especially glass factories, were lured to Bowling Green by the prospect of cheap fuel. During this time, there were at least five glass factories in Bowling Green. Two disastrous fires in August 1887 and October 1888 burned large sections of the commercial district. The fires destroyed more than one-quarter of the business blocks. Rebuilding began immediately, and the buildings in the Main Street Historic District are a result of the post conflagration period. By the early 1900's, the boom was over—most of the gas had been removed from the ground—and the town settled down to the agriculture county seat existence it previously knew. Bowling Green achieved city status in 1900. Very few important buildings were constructed after 1910. The population of the city in the 1990 census was 28,176. The Main Street Historic District includes 44 two- and three-story commercial buildings, four newer commercial buildings and several municipal structures. The central business district is a contiguous two- block grouping, which emanates from the central intersections of Main and Wooster streets, referred to as "the Four Corners." Welcome to Bowling Green Ohio's Historic District, 2012, www.downtownbgohio.org, accessed October, 2015.